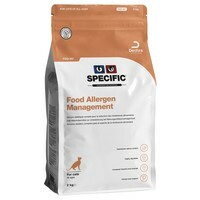 Specific Food Allergen Management FDD-HY Dry Food for Adult Cats is a complete and balanced food designed to help cats with food sensitivities and allergies. Containing a limited number of ingredients and hydrolysed proteins to make it less likely to cause an allergic reaction, Specific Food Allergen Management will help to reduce symptoms of ingredient and nutrient intolerances, acute intestinal absorptive disorders, and compensate for maldigestion. High Digestibility: Very high-quality ingredients make the diet perfect for patients with small intestinal diarrhoea.